In mentioning voting in her Democratic response to the State of the Union, Stacey Abrams (pictured on election night in 2018) voiced what was already becoming increasingly clear: Elections will be a key part of Democratic messaging in the coming years. In her response to President Trump's State of the Union address, Stacey Abrams went through some of the top issues for the Democratic Party. Health care. Climate change. Gun safety. Then she brought up a topic Democrats are planning to spend a lot of time on over the next two years: voting. "Let's be clear. 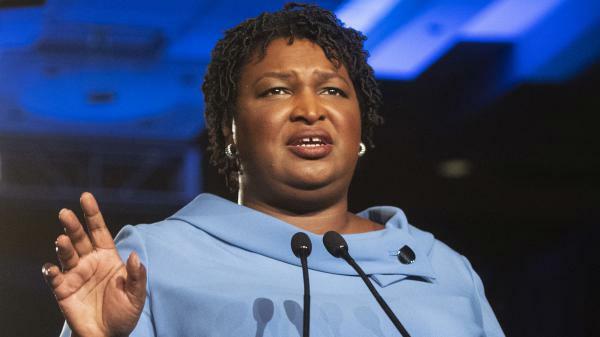 Voter suppression is real," Abrams said. "From making it harder to register and staying on the rolls, to moving and closing polling places, to rejecting lawful ballots, we can no longer ignore these threats to democracy." The past two federal elections seem to have been a tipping point. The 2018 midterms featured accusations of suppression in places where high-profile Democrats lost: in Georgia with Abrams, and in Texas with Beto O'Rourke. And in 2016, Russian hackers attempted to break into state election systems (succeeding in at least one state). President Trump also presents a clear foil. He has continued to call for measures that would make voting harder, like strict photo ID laws, without providing evidence for his claims about widespread in-person voter fraud. PolitiFact rated his tweet last month about noncitizens voting in Texas and California as "false." All of this has prompted Democrats to focus more on both voting rights and election security. "I'm running to fight for an America where our democracy and its institutions are protected against all enemies, foreign and domestic," said Sen. Kamala Harris, D-Calif., at an event launching her presidential campaign last month. "We will secure our elections and our critical infrastructure to protect our democracy." It remains unclear, however, whether any of that energy will lead to concrete changes before a 2020 election that cybersecurity experts are still worried about. House Democrats' marquee HR 1 bill has dozens of proposals they say would strengthen American democracy, including requirements for states to use paper ballots and to offer online voter registration, and it would make Election Day a federal holiday. Senate Majority Leader Mitch McConnell, R-Ky., has made it clear, however, that the bill is going nowhere. "Speaker Pelosi and her colleagues are advertising it as a package of urgent measures to save American democracy," McConnell said on the Senate floor. "What it really seems to be is a package of urgent measures to rewrite the rules of American politics for the exclusive benefit of the Democratic Party." But there is still a chance that more modest tweaks could become law. At a meeting with state election officials last weekend, Senate staffers said lawmakers would reintroduce the bipartisan Secure Elections Act in the next few weeks. The bill would be aimed at improving communications between federal agencies and the state officials who run elections, but it probably wouldn't include any money for states to purchase new equipment. Vermont Secretary of State Jim Condos noted that presidential primaries are only a year away, and election officials can't perform major technical overhauls the year of a presidential election. "Time is really of the importance," said Condos. "If you're going to get money to the states, we really need it this year. Preferably sooner than later." Some state officials say it's frustrating to hear Democrats talking about voting as a national problem just months after a midterm election that featured no major cyberattacks and the highest voter turnout for a midterm in 50 years. John Merrill, the secretary of state of Alabama, said he's expecting Democrats to use his state as an example on the campaign trail. "They'll come to our state and talk about voter suppression and how we're preventing folks from voting and they're entitled to their own opinion but not their own facts," said Merrill, a Republican. "When we've broken every record in the history of the state for voter participation in the past four elections we've had, there's nothing you can say except 'Roll Tide!' " referring to the slogan of the University of Alabama's vaunted football team. While the state has increased its voter participation over the past decade, Alabama's voter turnout rate still ranks among the lowest in the country. And overall, the U.S. trails most developed countries in terms of the percentage of adults who vote. It's a political cliché at this point to say high turnout favors Democrats. That's because many of the blocs of voters with historically lower turnout rates, like nonwhite voters, tend to vote for Democratic candidates. So while it is generally in their political favor to argue for easier access to the ballot box, California Secretary of State Alex Padilla, a Democrat, says it's also an expression of the country's values. "We are all in agreement that our democracy is strongest when we have the highest levels of participation possible," Padilla said. "It should not be a partisan issue, but unfortunately it has become one." And judging by the past few weeks, it will continue to be one, at least through 2020. Democrats are getting clearer on their priorities for 2020. And one of them is voting rights. Here's NPR's Miles Parks. MILES PARKS, BYLINE: Stacey Abrams took the stage in Atlanta on Tuesday night for the Democratic response to President Trump's State of the Union. She gave a sort of party policy greatest hits - health care, climate change. Then she went somewhere it looks like Democrats are planning to go a lot the next two years - voting. STACEY ABRAMS: Voter suppression is real - from making it harder to register and stay on the rolls to moving and closing polling places to rejecting lawful ballots. We can no longer ignore these threats to democracy. PARKS: The 2018 midterms featured accusations of suppression in places where high-profile Democrats lost - in Georgia with Abrams and in Texas with Beto O'Rourke. President Trump also presents a clear foil. He's continued to call for measures that would make voting harder, like strict photo ID laws, without providing evidence for his claims about widespread, in-person voter fraud. All this has prompted Democrats to focus more on voting. Here's Senator Kamala Harris at her presidential campaign launch event last month. KAMALA HARRIS: We will secure our elections and our critical infrastructure to protect our democracy. PARKS: What's unclear is whether any of this will actually mean concrete changes before the 2020 election. House Democrats released their marquee bill last month that has dozens of proposals aimed at strengthening American democracy. More than 50 pages were devoted to voting issues alone, things like requiring paper ballots and online voter registration, even making Election Day a federal holiday. But Senate Majority Leader Mitch McConnell made it clear on the Senate floor that the bill is going nowhere. MITCH MCCONNELL: What it really seems to be is a package of urgent measures to rewrite the rules of American politics for the exclusive benefit of the Democratic Party. PARKS: There is a chance that more modest tweaks could become law this year, however. At a meeting with state election officials last weekend, Senate staffers said lawmakers would soon reintroduce the bipartisan Secure Elections Act. That bill would improve communications between federal agencies and the state officials who run elections. But it probably won't include any money for new equipment. JIM CONDOS: Timing is really of the importance. PARKS: That's Vermont Secretary of State Jim Condos, who notes presidential primaries are just 12 months away. CONDOS: If you're going to get money to the states, we really need it this year. PARKS: At the meeting, a number of state officials said it was frustrating to hear Democrats talking about voting as a national problem just months after a midterm election with the highest voter turnout in 50 years. John Merrill is the Republican secretary of state of Alabama. He's expecting Democrats to use his state as an example on the campaign trail. JOHN MERRILL: They'll come to our state. And they'll talk about voter suppression and how we're preventing folks from participating. And they're entitled their own opinion but not their own facts. When we've broken every record in the history of the state for voter participation in the last four elections that we've had, there's nothing you can say except Roll Tide. PARKS: While the state has increased its vote totals over the past decade, Alabama's voter turnout rate still ranks among the lowest in the country. And overall, the U.S. trails most developed countries in terms of the percentage of adults who vote. It's a political cliche at this point to say higher turnout does favor Democrats. That's because the voters with historically low turnout rates, like nonwhite voters, tend to vote Democratic. But while it's generally in their political favor to argue for easier access to the ballot box, California Secretary of State Alex Padilla says it's also an expression of the country's values. ALEX PADILLA: We're all in agreement that our democracy is strongest when we have the highest levels of participation possible. It should not be a partisan issue. But unfortunately, it has become one. PARKS: And judging by the past few weeks, it will continue to be one, at least through 2020. Miles Parks, NPR News, Washington. (SOUNDBITE OF THE OLYMPIAN'S "SATURN") Transcript provided by NPR, Copyright NPR. Vermont Secretary of State Jim Condos just returned from the National Association of Secretaries of State meeting in Washington, D.C. We're talking with Sec. Condos about what he learned at the NASS meeting about voting security and cyber threats facing states today, and discussing constitutional amendments in the legislature.